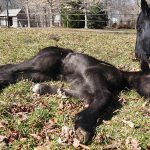 Precious, a rare and endangered Dales pony, grazes near her newborn foal that was delivered on March 25 on the Scottsdale Farm in West Tisbury, owned by breeder and trainer Cynthia Bermudes. The boys opened the track season with a solid team effort to defeat Abington. 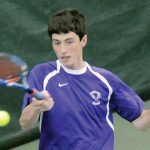 The Vineyarders started the defense of their state championship with a weather-suspended match at rivals Dover-Sherborn. 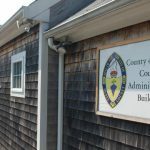 The conservation commission and the planning board approved a complex plan to save a Wasque Point luxury home from tumbling into the ocean. 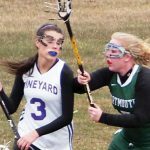 Alyana Hutchinson scored four goals but the Vineyarders came up short against Dartmouth Wednesday afternoon. 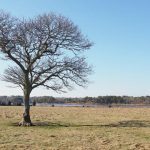 In an 11th hour deal to protect the West Tisbury farm property from development, the Land Bank will buy 13 acres and protect another 25. 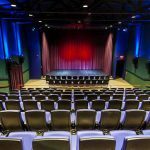 The film society will name its new theater for philanthropist and donor Marilyn Meyerhoff. 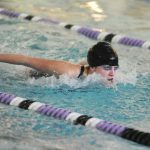 Martha's Vineyard Regional High School athletes earned post-season honors in swimming, basketball and hockey. Town officials want the Edgartown Library Foundation to release the $175,00 it raised for the town project. Chilmark lawyer Ron Rappaport said the comments were not libelous, but he advised town officials to be more civil to one another. The board wants to hear from Oak Bluffs Monster Shark Tournament organizer Steve James before giving final approval. A story published March 21, "Kibbles and beds," incorrectly reported that the Mansion House charges $50 per night per dog. The state's finance and development agency has issued an $8 million lease to help Boston MedFlight buy a new helicopter to replace an older one, the State House News service reported. 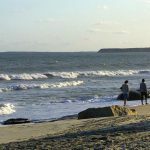 The Martha's Vineyard Regional High School's 16th Annual Linguini Bridge Contest in the Performing Arts Center on Monday, April 1, promises to be a shattering experience. 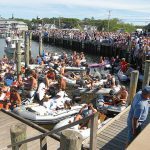 Bruno's Roll-Off of Edgartown submitted the winning low bid of $2,267,250 for a five-year contract to manage the Oak Bluffs and Tisbury joint transfer station for municipal refuse in Oak Bluffs. 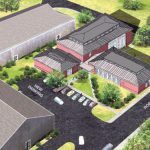 At their regular meeting on March 20, West Tisbury selectmen tentatively agreed to explore other options for the development of a photovoltaic array at the town landfill off Old Stage Road. 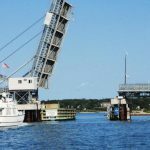 The money, design, and permits are in place for the permanent Lagoon Pond drawbridge that will replace the temporary bridge built in 2010, bridge committee chairman Melinda Loberg of Tisbury said. 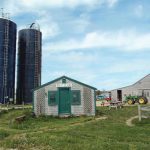 In February, Edgartown approved a plan by Cingular Wireless to hide antennas in the silo the company said will improve wireless coverage.